Can live-tweeted surgery be of public health interest? Live-tweeted surgery, or twurgery as it has been nam ed, is spreading. As written previously on this blog a number of surgeries have already invited Twitter into the operating room, for example by Aurora St. Luke’s Medical Center who live-tweeted from a brain surgery. Rex Healthcare in Raleigh, North Carolina have now joined the club by live-tweeting a hysterectomy. Having followed a surgery live through Twitter myself, I admit that it is for some reason fascinating. I have previously watched surgeries on video and even attended some in person and yet there is some different about following it on Twitter. Apart from the fascinating element I do however struggle a little bit with the value of these twurgeries. Do they have any role to play seen from a public health perspective? Or is marketing and branding of a particular hospital or a specific technic the overriding ground for the twittering hospitals? The main rational behind the Twitter event at Rex Healthcare was, according to their eMarketing manager, Jason Papagan to “showcase the leading edge medical procedures we have here.” [see full quote here]. Other hospitals have brought social media into the operation room for similar reasons, however most of them (including Rex Healthcare) also highlight that the objective is to serve as educational aid, informing medical students and patients about modern surgery. For Aura Health Care, who tweeted from an awake temporal lobectomy, the objective was, apart from demonstrating their advanced brain surgery skills also to illustrate to patients suffering from epilepsy that surgical treatment is an option and to defuse the procedure a little bit. If awake temporal lobectomy is an appropriate but underused treatment against epilepsy and if an event like a live-tweeted operation can help open the eyes of patients and their relatives to the procedure, then I guess on could argue for a public health interest in the bringing social media all the way into the surgical theater. If this be the case, then I guess it would also be of interest to publicly funded hospitals to tweet or for patient organisations to advocate for this means of communication. According to my knowledge, this is yet to occur. It would be interesting to hear other people’s thought on this issue. Whom benefits from live-tweeted surgeries? Can it be considered a means of science communication? Is there a public health component to them? The questions are many. Think my head will need to struggle with this one for a little bit longer. To those of you who have been reading my posts about the Live-tweet brain surgery, which was performed at the Regional Epilepsy Center at Aurora St. Luke’s Medical Center (Aurora Health Care) in Milwaukee, Wisconsin, I myself have been wondering how the patient is doing and what experience came out of the whole Twitter event. Peter Balistrieri, Manager of Digital Communications at Aurora Health Care have been so kind as to share some of the experiences on my previous post in the comments section and to those that haven’t read that far I thought I’d just link to 10 tips for tweeting a successful brain surgery. The tips are very hands-on and seem specifically directed towards others considering taking up live-tweeting from the surgery room. But there are some interesting aspects also for people outside the world of surgeries and hospitals. For example I find the recommendation of developing a relationship with the patient and doctors and surgeons prior to the Twitter surgery interesting. This is not only of benefits to the tweeters but also to the followers and gives a story-telling feeling to something otherwise very clinical and sterile. That said I do miss a little bit of post-twitter-surgery-follow-up. Firstly, how is the patient, Geoffery, doing? We were all right there with him on the operation table, and curiosity bids me to wonder how he is doing today? And secondly, I am ver curious to know how the medical staff perceive the whole Twitter situation? Who followed the event and did it have the intended effect? What have the responses been? From patients, from colleagues, from patient organisations? Lots of question comes to mind and the only online follow-up that I have been able to find so far has so far been the before mentioned 10 lessons learned and an official announcement of a successful surgery with a short note that Geoff is doing well and that we’ll hear more from him 2+ weeks. I’m looking forward to that update. But also an update from the medical staff and perhaps for some reflections on the educational effect of the Twitter event, especially when putting on the ‘science communication’ perspective, which I would argue to some extend be relevant for an event like this one. Although I found it a bit over the top, I must say it got me curious, and before long I was actually pretty drawn to the live-tweets. 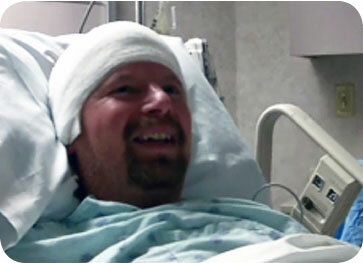 From the Regional Epilepsy Center at Aurora St. Luke’s Medical Center (Aurora Health Care) in Milwaukee, Wisconsin, a live-tweet of an awake temporal lobectomy (read more about temporal lobectomy here) on the epileptic, 43-year-old Geoffery Nestor took place on September 27, 2011. The objective of the surgery was to remove a portion of the brain which causes the epileptic attacks. It is the most common type of epilepsy surgery and is also the most successful type. Being quite certain that the surgeons had their hands full, the tweets were written by people from the hospital’s Social Media & Digital Communications, however present in the room and in close contact with both the patient and the doctors. but also comments from the awake patient Geoff (eg.”Geoff says to Dr. Morris: “Tell my wife I love her. And that this isn’t as bad as I thought it would be.“). In addition, and some of the tweets gave general statistics on the number of epileptic patients in the US, information about the operation and instruments used etc. All in all a good variation. Using the hashtag #ahcneuro it was of course possible for the followers to comment, retweet etc. It was interesting to see for example how epilepsy patient organisations were retweeting and encouraging their followers to follow the surgery. Questions and comments raised to the tweeters were in most cases responded to which gave a very good and interactive feeling. Although this was my first experience with live-tweeted surgeries, it is not the first of its kind. I haven’t been able to find out which was the first Twitter-broadcasted surgery, but a minor robotic cancer surgery in Henry Ford Hospital in Detroit in January 2009 seems to have been one of the first. Since then knee surgeries have been tweeted, kidney operations and most likely other operations have made it to Twitter. The phenomenon has in some cases even been given a name : Twurgery. Live-twitter surgeries have even made it to the television screens in an episode of Grey’s Anatomy. First, the health system wanted to publicize the availability of the procedure, which it calls (pdf) MAKOplasty, to patients and referring physicians. So far, I haven’t been able to identify live-twitter surgeries in hospitals outside the US, and I’m quite convinced that such an event have surely not taken place in a Danish operation room. Will it come? Well, I can’t really see why it shouldn’t. Of course things can always be miss used and there needs to be a clear objective and it does of course require consent from all parties involved. Learning from their experiences, some of the hospitals who have already tested live-tweeting have shared best practices and lessons-learned, which other hospitals might want to check out before sending tweeters into the operation rooms. To me, if done in a proper manner, this is an interesting way to do science communication. Getting not just medical staff but also the rest of us into the operation room once in a while, is not such a bad idea. People working with public health also need to know what actually happens in an operation room. And with Twitter we can be there without being in the way, faint over the amount of blood or ask questions at inconvenient times. 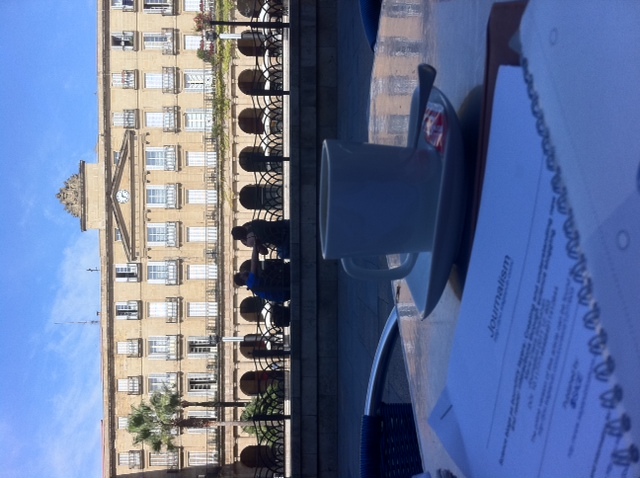 In stead we can be sitting on Plaza Nueva in Bilbao, Spain drinking a coffee..